The March installment of Karnival see’s Scotlands latest techno export Harvey Mckay hit the capital! Described by Mixmag as ‘probably the techno pages most regular contributor’, Harvey McKay has created a distinctive style with a name that is synonymous with driving, soulful techno. He has worked his way into the Drumcode stable with 3 top ten EPs, gaining support across the globe as one of the hottest techno producers around. 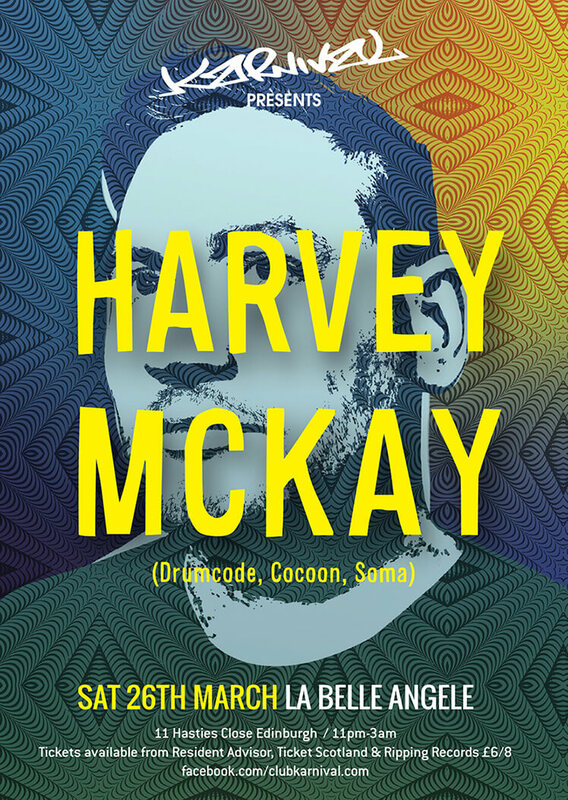 As a DJ, Harvey has an exceptional skill to read the crowd and has played at some of the biggest clubs around the world – Space Ibiza, Awakenings, Ultra Music Festival, Fabric, Space Miami and many more, he recently closed the first night of Loveland Weekender and has shows coming up at Intec’s Sonar party, headlining the Elrow Stage at 18hrs Festival and his debut Australian tour. With 3 Beatport Techno No.1’s to date, 9 top 10 releases Harvey was also Beatport techno’s 4th best selling artist of 2014. He has released on all the techno stalwarts: Drumcode, Cocoon, Bedrock, Intec and Soma.